We talked about going to Croatia for several years. There were many debates on which cities we couldn’t miss. I started planning our summer trip to Croatia at the beginning of 2013 and by May we had scrapped that trip to go around the world. The main reason was we never had enough time to do it all. Croatia was partially responsible for starting this whole trip. Istria seemed the perfect place to start in Croatia. We wanted to go here because it was a lot like Italy only cheaper. 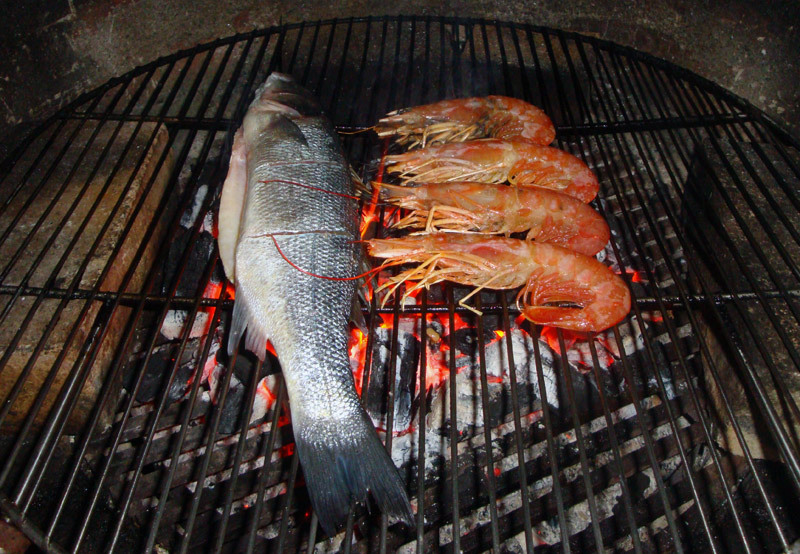 Istria, the northwestern part of Croatia, is known for seafood, wine, olives, truffles, cheeses and smoked meats. What’s not to love? 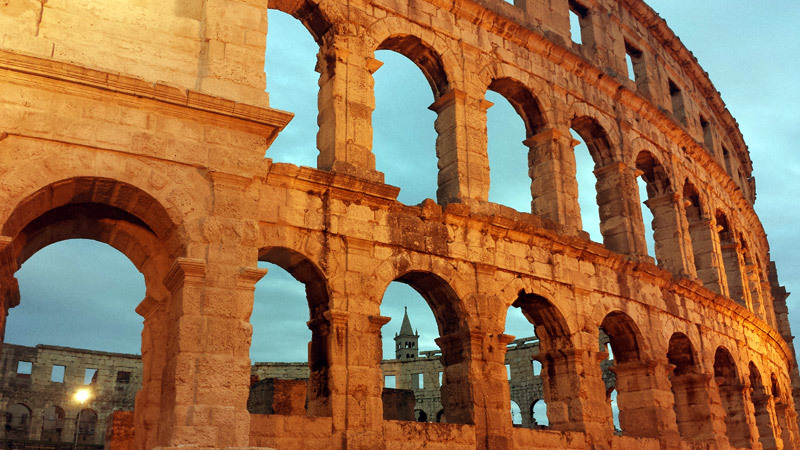 The Roman Arena in Pula, Croatia. We visited a few of the popular coastal towns. The coastal towns have a lot of Roman ruins and were built up as walled cities/forts during the Venetian rule. You can still see the remains of several roman structures in a lot of the Istrian towns. This region was passed around over the centuries from various wars. It has been part of Austria-Hungary, Italy, Yugoslavia and finally an independent Croatia since 1991. This city was number one on my list of Istrian cities to visit. It is a gorgeous walled city with Roman gates, cobble stone streets, and great beaches. You can go swimming right off the city walls into crystal clear blue water. A plunge in the Adriatic is a little exhilarating, but on a hot summer day it is quite refreshing. You will be amazed at how quickly you cool off. 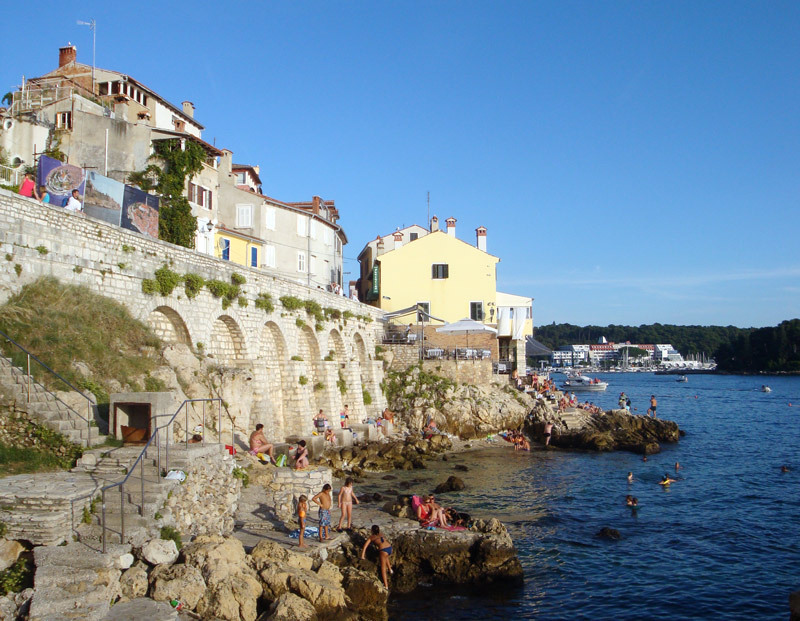 Go for dip off the cliffs of the old town in Rovinj. One of the best known places for swimming or biking in this area is the Punta Corrente Forest Park. It is a pine and oak grove forest where you can choose to lay out on a big rock in the sun or on the soft pine bristles in the shade. It reminded us of state parks in Indiana on one side with the sea on the other. 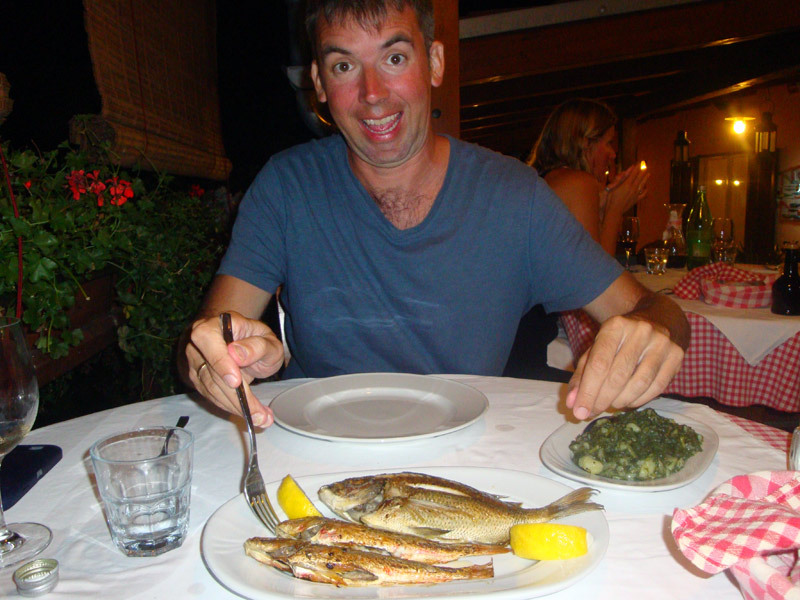 Rovinj is known as a fisherman village, so I had to have some fresh fish. This can be hard to do on a budget because fish is the one thing that is always expensive. We were able to find a place on the water just off the main area of town we could afford. Maestral was located in an old stone house on the water with their grill outside, so you could see and smell the fish cooking. I had the grilled Branzino, a popular European Sea bass, and Mark had the grilled sardines. Both were delicious. 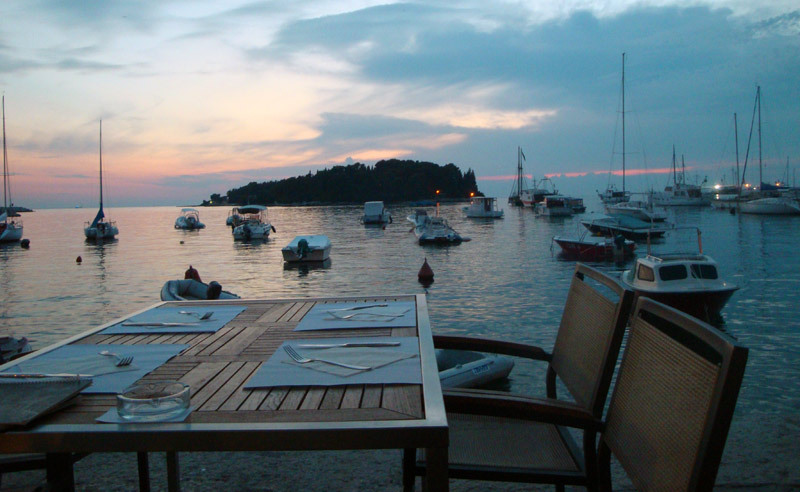 Dining harbor side in Rovinj. Wait until after sunset and the restaurants clear out and you can enjoy dinner with all of the Italians who don’t eat dinner until after 9pm. Of course I had to go looking for the best pizza in Rovinj and I found it at Da Sergio. It was perfectly charred wood-fired pizza with a chewy crust. 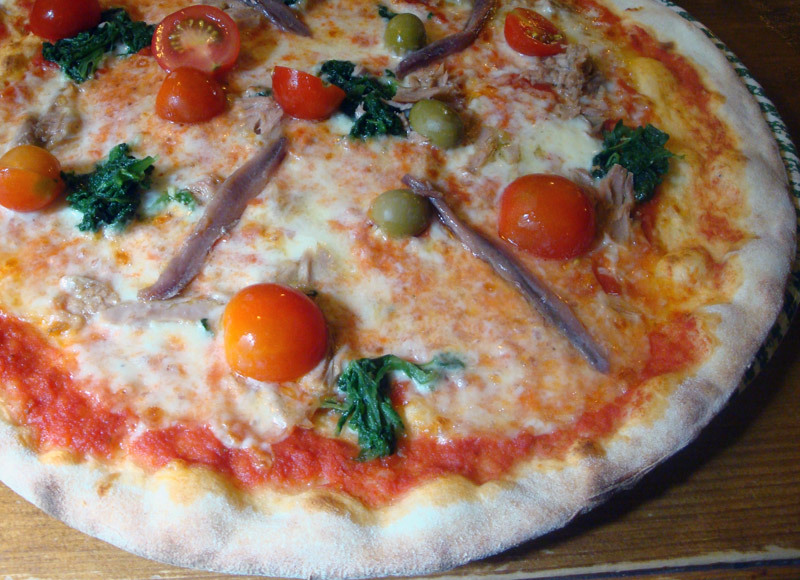 I enjoyed mine with anchovies, but there are several different on varieties to choose. This was a great place to stop on the way to the city beach. Rovinj is the place for buying souvenirs or clothes. The many vendors mark items up and then negotiate prices, so be ready to work for it. Most places will only take cash. One rainy day I ventured into town for a dress and a new swimsuit. You can also buy truffles, olive oils, lavender and honey from various stands at the city market. We stayed in a small town outside Pula for a week. There wasn’t much there except a small market that closed early. The town did have multiple hiking and biking paths. We were able to hike to some nice secluded beach areas near the marina. There was also a fresh fish market and a large grocery store a small hike away in the town of Banjole. The place we were staying had a grill, so we decided to utilize it by going to the fish market. I didn’t consider the fact that the fish from the market wasn’t gutted or scaled. After a quick online tutorial, I was ready to prepare my fish for the grill. One long slit down the belly and you can easily pull out the inedible parts. Mark seemed to be amused as I asked for scissors to figure out how to cut out the gills. You can easily scrape off the scales with the back of a knife, but I recommend not doing this inside like I did. They go everywhere. I must say our first attempt wasn’t too bad and I feel much more confident about cooking a whole fish in the future. Our whole fish on the grill in Vinkuran. One of our day trips was a short bus ride away from Vinkuran. 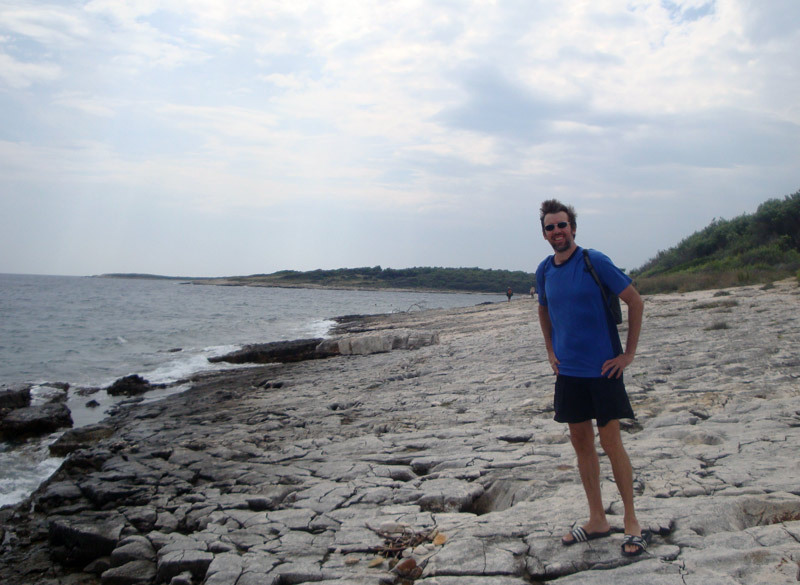 Kamenjak Park, on the Premantura Peninsula is Istria’s southernmost point. It takes some walking to get to the beaches, but they are worth it. The park is also known for windsurfing which is fun to watch. We spent our day laying on a rock and swimming off the edge of the forest cliffs. On the windy side of Kamenjak. We hiked into Banjole on our last night in Vinkuran to eat at Konobo Batelina. This was probably our best meal of the entire trip. We cooked at home all week to save money, so we could have this dinner and it didn’t disappoint. We booked a reservation the second day we were in Vinkuran and couldn’t get in until the night before we left. The menu is based on what was caught that day. In fact the waiter is the menu. He tells you what there is and you decide. You only know ball park prices based on the size of fish you pick and a generic menu posted outside the front door. The appetizer was a variety of samplings like tapas including marinated anchovies with a conger eel mouse, white sea bream Carpaccio, tuna tartar, octopus salad, shark confit and red mullet with olive oil. We also had some of the house shells with mussels, clams and scallops. The waiter comes to the table with a platter for you to pick out your fish. We split a bream and had 2 small mullets all grilled and served with cooked greens and potatoes. We finally had to tell the waiter if we hit a certain cost point to cut us off. Luckily, we never hit our ceiling even with the house wine and were able to have a nice white chocolate cake for dessert. 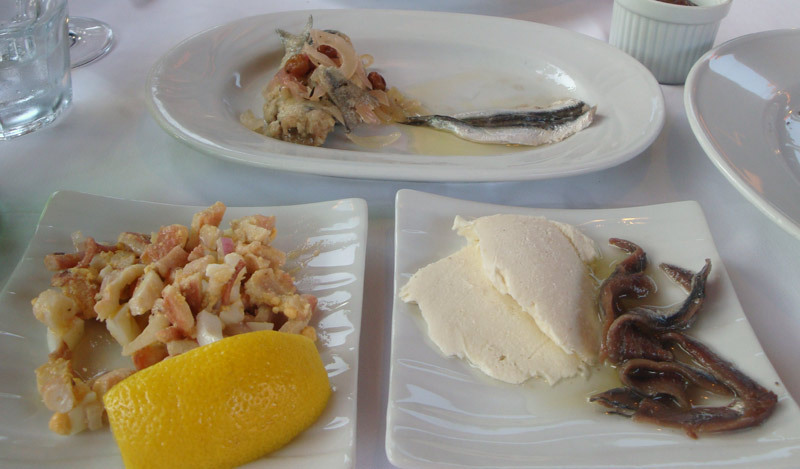 Octopus salad on the left, conger eel mouse and marinated anchovies on the right, and sardines above. Mark digging into the bream and mullet. 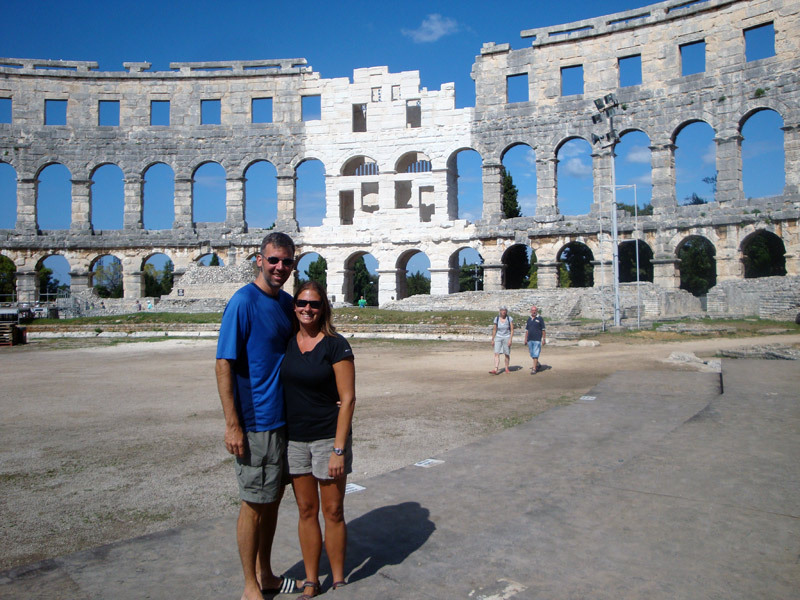 We visited Pula as a day trip from Vinkuran, but then ended up there for three nights after we were denied entry into Slovenia. The main attraction is the Roman amphitheater. You can walk around the outside for free, but if you want to go inside it is around US$6.50. Concerts are held here during the summer, but none were going on while we were there. On the floor at the Pula Arena. You can wander around all day up and down the hills of the town to view the Temple of Augustus, the cathedral and the Arch of Sergius and the Fort Punta Christo. You can see everything on the outside for free. Otherwise, you pay per place you want to visit. We only went inside the amphitheater. If you happen to find yourself outside the arch and in need of a snack there is a great french fry. You can even eat them while having a beer at one of the many bars in the area. No one seems to care if you have outside food. 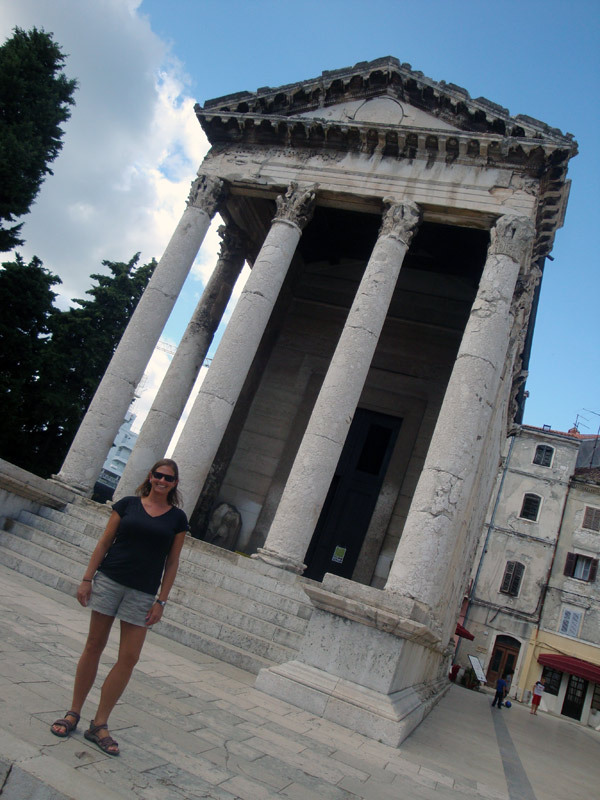 In front of the Temple of Augustus in Pula. Do not go in July and August. These are the peak tourist months. It is harder to get accommodations and the prices are much higher. We started at the end of August and could really see the difference as the weeks passed into September. The prices are cheaper, you have greatly reduced crowds and you don’t have to make a reservation for everything. Most people speak Croatian, German, Italian and then English in that order. Many Germans come to this region for holiday. All the beaches are rocky. Bring or buy water shoes. You might also want a mask and snorkel because the water is very clear. We spent one day without shoes and that was enough. They weren’t too expensive and they sell them everywhere. Your feet will thank you. Malvazija is the main type of dry white wine in this region. We would buy it at the store and eventually found a box brand we liked, Vina Laguna. We only drank house wine in restaurants and even if it is not on the menu you can just ask for it. It is usually in a ½ liter or 1 full liter. A year seemed like a really long time when we started this adventure, but I have realized it still isn’t enough time to see it all. You could spend your entire life traveling and never see it all. We plan things around what is most important to us, scrap the things we can live without and leave some room to add something unique to the area. One of our favorite games is creating future trips. We decide where we would return, what we would leave out and what new place we would add. Due to our unfortunate circumstances of not being able to go to Italy, Croatia is now the place I have spent the most time outside the US. Next time we come back it will be for a trip to Sicily, the Croatian islands and Greece. If we could go by boat, it would be even better. Those damn anchovies just look like gutted worms… UGH.. I’m sure that they added just the right saltiness to the pizza but I’m not sure I could do it. When I grow up, I’m going to be Julie…. I would never touch them but I got some on bruschetta at the Indy Italian Fest a few years a back and love them now. Actually picked some up at the store today to use in pasta this week. love reading about your trip. Constantly amazed that you two have the guts and balls to do it 🙂 we are supposed to get our first frost in the next few days and the trees are really showing their colors. Missing you guys especially for Colts games and the upcoming annual Russell Halloween party. Never thought about Croatia as a tourist spot but it sounds wonderful. I’m sure you are inspiring others to travel. Stay safe and enjoy! I always love reading about your adventure. After reading this blog you might consider writing a book about your adventure on a shoe string budget.$$$$$$$. You both take care, continue enjoy your adventure.